This life size bronze equestrian statue of Ramon Berenguer III was sculpted by Frederic Marès and inaugerated in 1950. 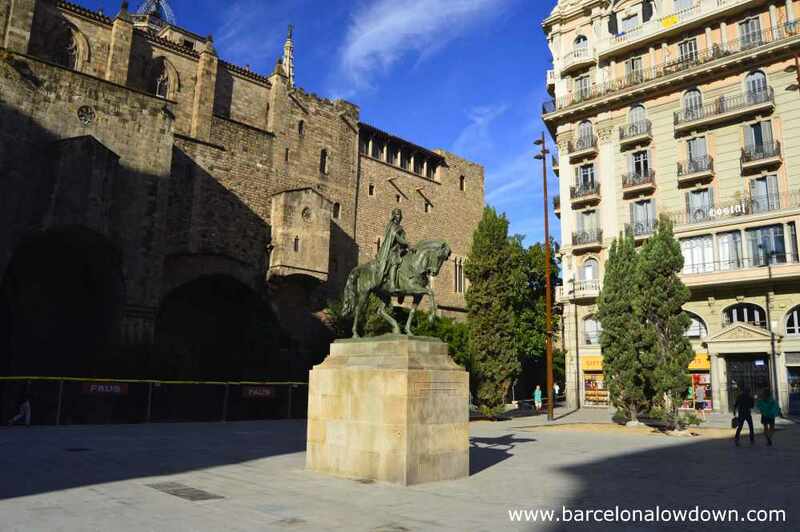 Located in Plaça Ramon Berenguer el Gran, the monument is a replica of an earlier statue which was created by Josep Llimona for the Barcelona Universal Exposition of 1888. 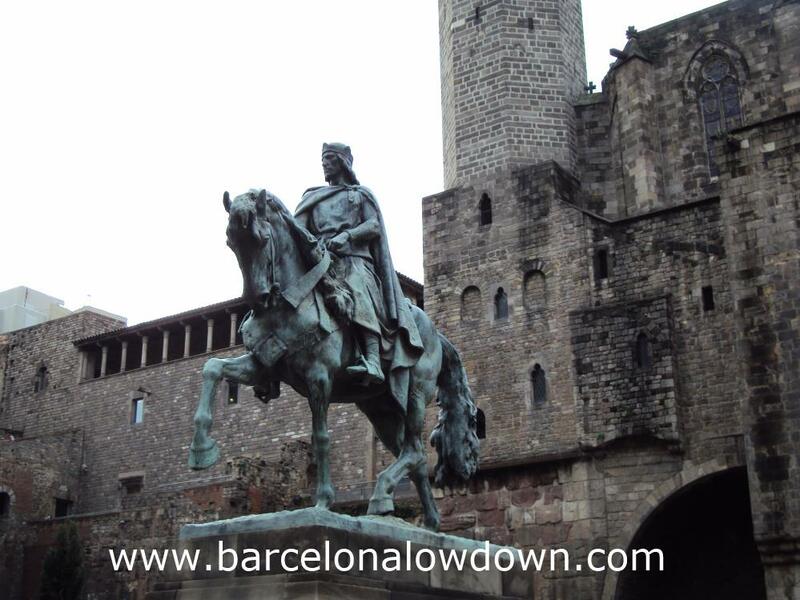 The Count, who ruled Barcelona from 1097 to 1131, is portrayed in regal pose riding his horse Danc. The ancient Roman walls of Barcelona and the medieval Palau Reial make a perefect backdrop. Who was Ramon Berenguer III ? 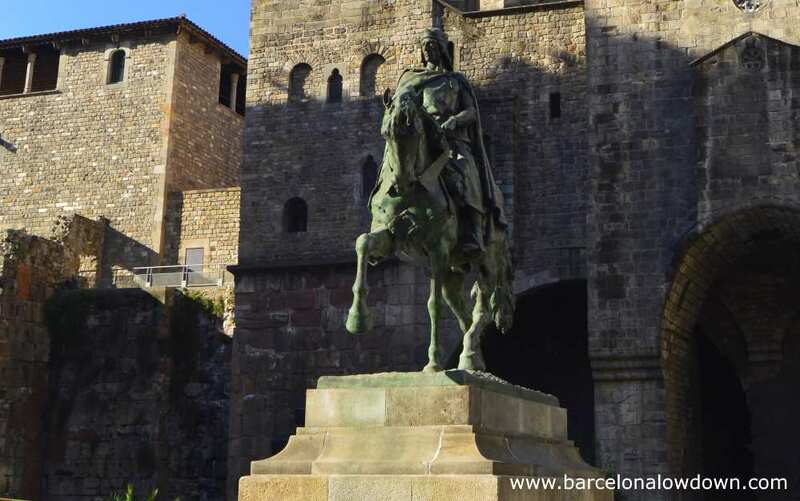 Born in Rodez (France) in 1082, Ramon Berenguer III (the Great) inherited the title of Count of Barcelona from his farther (Ramon Berenguer II) when he was just 14 years old. The young count initially co-ruled with his uncle Berenguer Ramon II who died fighting in the First Crusade. Ramon Berenguer III created alliances with the other Catalan counts and through a combination of military actions and tactical marriages, expanded his Catalan dynasty as far as Provence to the north and Tarragona to the south. When Pope Paschal authorized a crusade against the Moors in the Balearic Islands, it was Ramon Berenguer III who led the Christian fleets which conquered Ibiza and Mallorca in 1114 and 1115. Shortly before his death in 1131, the count joined the Knights Templar and was buried dressed in the white robes of the order in the Monastery of Santa María de Ripoll. Best known for his modernista style sculptures Desconsuelo and Juventud, Josep Llimona was born in Barcelona in 1864. He studied at the famous La Llotja art school and at the age of 16 went to Rome to continue his studies. During his stay in Rome he designed the statue of Ramon Berenguer III as well as the panels for the Christopher Columbus monument. Another graduate of Barcelona’s La Llotja art school, Frederic Marès was born in Portbou in 1893. After completing his studies in La Llotja, Marès worked with Eusebia Arnau and travelled to Paris, Rome and Florence. His sculptures combine Modernista and Gothic styles and his best known work is Alegoría de Barcelona which is located in Plaça de Catalunya. In addition to being a sculptor, Marès was a keen collector who collected art from across Spain, most of which is on display in the Frederic Marès museum.